Sun/Liferay: Why? And What Is the Next Step? Sun Microsystems Joins Liferay Open Source Community / Sun’s new Web platform to leverage core elements of Liferay Portal 5.0.One interesting thing is Brian Chan’s blog entry about Liferay and Sun explaining how they have been working together so far… to fill the limitations of each other solutions. So today what does that means? Liferay is leveraging the development power of Sun to implements standards (for example JSR-286). I have always been frustrated by the lack of standard support and ‘real’ innovation in Liferay (compare to its competitors such as eXo Platform, and Jboss for example). In the other hand Sun will leverage the “tiny Liferay product” killing its own solution. Sun’s portal is really to big without that benefits for developers/users (compare to its competitors, BEA,IBM, Oracle for example). So what’s the next step for this partnership? If Sun wants to push a real portal offering, it can only finish by a full acquisition of Liferay… even if it is stated that it is not the plan. BOF-5634 - Java EE Platform Connector Architecture 1.6 Overview. I have been using J2CA a lot lately when dealing with SOA in large IT department… So quite cool to have an update on this spec. I have probably selected many conflicting sessions, not really an issue since I am not going there. That said, this year again JavaOne looks quite exciting and a lot of content again around Scripting Languages and Framework; Web2.0 related technologies and SOA. Last Friday (April 18th) I was attending the launch of “eXo WebOS” in Paris. Benjamin Mestrallet, creator of eXo has started the event with a presentation of the solution and its impact on the IT. Like any internet user, each time I see eXo Web OS and applications I am very very impressed. They have pushed very far the use of AJAX based applications to offer a complete virtualization of the OS/Desktop, not in a Virtual Machine, but simply in your favorite browser. 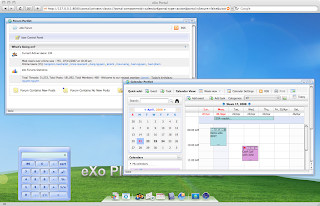 As you can see in this screenshot, eXo is launching in your browser, a complete desktop, where I run many applications provided by eXo: Calendar, Forum, Mail, but a also a calculator gadget attached to the desktop itself. The easiest is to try the product, go to eXoplatform site and download it. If you are an Oracle Application Server user, you may know that it is possible to expose database resources as Web Services using the OracleAS Web Services stack. You can for example using JAX-RPC based Web Service create service on a PL/SQL stored procedure, a SQL statement and even poste message on a queue (AQ). This is available in the Web Service Assembler (wsa) tool and also JDeveloper. At the end when you have executed the wizard, you have a complete JavaEE application ready to be deloyed. All the JDBC calls and PL type mapping are done automatically by the wizard… very neat Take a look to the Assembling Database Web Services documentation. It is important to mention that such service can leverage the WS-* support of OracleAS and any JAX-RPC handler you want to add to the service. Orale RDBMS introduced a new feature that is called: Native Oracle XML DB Web Services, that allows developer to directly expose Web Services from the DB. Take a look to the chapter Using Native Oracle XML DB Web Services. Now that I am back in consulting business, I often have customers where I am not allowed to connect my Mac on the network. Annoying!!!! But this is not a big issue since now it is easy to bring you environment on a USB key. On a daily business, I have installed my personal XWiki on my 2Gb USB Key, and a JDK (for windows, on OSX I am using the default one). So with this solutions I have my personal CMS, Website and applications with me, and I can use it from any computer available. I work on any site, any meeting room directly on my Wiki even when I am not connected. I am using a packaged Entprise XWiki that comes with Jetty and HSQL, so it is a complete and self contained environment. I just changed the start and stop scripts to point to the JDK that is on the key. Nothing exceptional here, but it is very useful. Oracle Acquisitions… Cannot Remember All of Them? Oracle Strategic AcquisitionSome others are probably missing since in 2003/2004, Collaxa was acquired by Oracle. If you do not remember Collaxa was the first release of the BPEL Process Manager. You can also take a look to a part of the site that I like that is the Oracle’s history. WikiMatrixThis tool can help you to find the best Wiki for you needs, free or not, hosted or not, … and many other criteria. Oracle JAX-RPC: How to Change the Character Encoding? By default Oracle Web Service client is sending the SOAP messages using an UTF-8 encoding. This is the recommendation of WS-I Basic Profile. To be exact it says UTF-8 or UTF-16. Most of the Web Services stacks are offering the same kind of utility to do that, for example here the property you must set to do the same in IBM’s JAX-RPC implementation: com.ibm.wsspi.webservices.Constants.MESSAGE_CHARACTER_SET_ENCODING. Last week, more than 400 people of Sogeti group were meeting at Les Fontaines, for the annual KickOff. It was for me the first big event since I have joined this company last October. First of all it was a great experience to meet my colleagues from all over the world , Sogeti is a company of 16,000+ people, all over Europe, in the USA and India. The main theme of this 2008 Kickoff was “Web 2.0”, the reason why I was invited indeed. If most of the technical people are using internally and externally Web 2.0 tools such as wikis, blogs, ims, .. It was important to have during this kickoff an “overall” brainstorming about the use of this tools for the group, but also how we can leverage of knowledge to help customers to be more efficient in their business. Rod Bekstrom, co-author of the well known book “The Starfish and The Spider” focusing on the fact an company must shift from a centralized organization to a decentralized one. You can listen to the presentation online on Rod’s site.. I have to say that I soon as I have finished my current readings (RestFul Web Services-O’Reillys & Get Things Done) I will order this book. I really found some inspiration in Rod presentation, and his ideas could be immediately put in place in your organization or at your customer site. Last but not least, Nick Donofrio, EVP Technology and Innovation, talked about the important of innovation for the enterprise, and how we do not control the changes but we should adapt to it in a productive manner to stay at the top. I really enjoyed all these presentations, in addition to the one that I have cited, we had many Sogeti’s speakers including Sogeti CTO Michiel Boreel.